From Einsiedeln, Stiftsbibliothek, Codex 149(558), page 172, a 10th-c. manuscript. Drawn at the very end of Boethius’s Consolation of Philosophy. 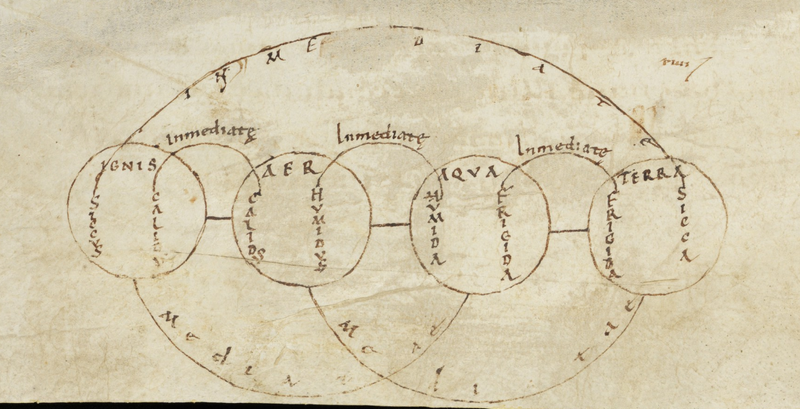 Here we see the four element, from left to right: Fire (Ignis), Air (Aer), Water (Aqua), and Earth (Terra), with their constituent qualities of dryness (Siccus), heat (Calids*), wetness (Humida), and coldness (Frigida). This entry was posted in MedievalBlog and tagged manuscripts, medieval by medievalkarl. Bookmark the permalink.